Collectors take note! This is a great collector's item! Order soon - We have only a few of these wonderful knives. 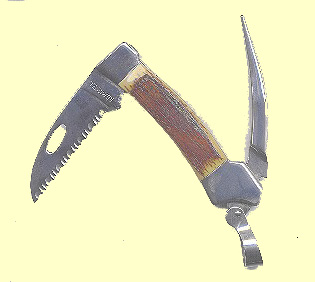 For a few years, A.G. Russell of Springdale, Arkansas produced an excellent advance in the design of the traditional Sailor's Folding Knife and Marlinspike. They replaced the straight-edged sheepsfoot blade with a fully-serrated hawkbill, and made the whole knife extra heavy! (It worked superbly for me on a two week cruise out of Camden Maine - whether cutting nylon, or yacht braid, or cutting through lobster shell!) This superb heavy duty scrimshaw folding knife was made completely from stainless steel in Seki City, Japan, fabled city where many of the world's finest ivory knives have been produced for hundreds of years. Bolsters are also stainless. The tough, sturdy hawkbill blade is made from VG-10 super stainless, and has exceptional edge-holding ability. The blade is 2 5/8 inches long, and the marlinspike is 3 1/8 inches long. It is 4 1/4 inches closed. This is a superb tool to have as a companion on any cruise...You can bet your life on this Scrimshaw folder! It comes with its own genuine leather belt sheath or soft zippered collector's case! Any sailor would love to have and use this ivory folder knife. Anyone who loves nautical collectibles will jump at the chance to own one of these personalized folding knives! With its Fossil Ivory scales, it makes a great heirloom gift for any mariner! Shown with Fossil Mammoth Ivory - Bark Ivory. We will scrimshaw 1) a ship (see our designs below), and 2) your name, initials, or the date on the Fossil Ivory scales at no charge. As an option, we will scrimshaw an etching of a ship of your choice, or your own boat (sail or power) on one side - Just email or snailmail us a picture. Customize and personalize your knife by choosing from the options below!